A few minor spine creases, very light cover wear. Into the Drachengrab Mountains! Hot on the trail of the marauding slavers, you and your fellow adventurers plunge deep into hostile Hills. Spurred on by your past success, you now seek the heart of the slaver conspiracy. This module contains a challenging scenario, a tournament scoring system plus nine pre-rolled playtested tournament characters. Also included are large scale referee's maps, note, and background information. 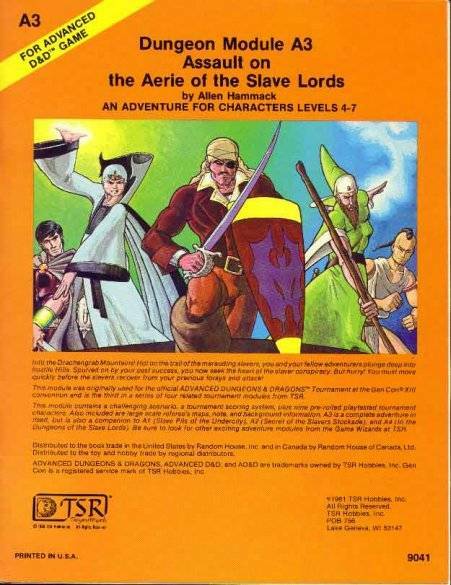 A3 is a complete adventure in itself, but it is also a companion to A1 (Slave Pits of the Undercity), A2 (Secret of the Slavers Stockade), and A4 (In the Dungeons of the Slave Lords).